The fleece pullover was developed to provide The Marine Corps with a multi-purpose, lightweight/low bulk, moisture transport, and insulation layer for the upper torso. 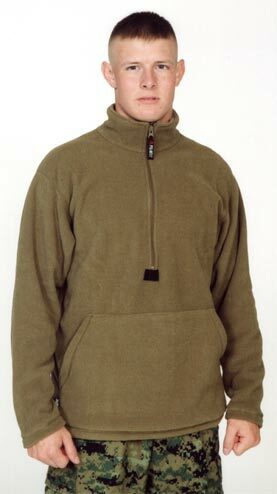 The fleece pullover can be used during both garrison and field duties in cool to cold weather conditions. It can be worn under the camouflage utilities, used as a sleep shirt in the sleeping bag, and as an optional/additional insulation layer for the ECWCS. The basic material for the pullover is 100% virgin polyester, circular knit terry, double-sided, lightweight velour (fleece) non-pilling Polartec 100 Style 7543M with moisture management properties. The fabric weighs 5.7 ± 0.5 ounces per square yard. The fleece pullover shirt has long sleeves, a collar that converts to a mock turtleneck when the front opening slide fastener is completely closed. The slide fastener front opening extends from the top of the collar to the mid-chest. The slide fastener is backed with a throat protection flap at the neck and has a thong for ease of opening when wearing gloves. The base of the front opening is reinforced with a 1 x 1-1/2 inch piece of nylon webbing. A large hand warmer pocket extends from the lower chest area to the base of the pullover. To provide additional insulation and lower back protection, the back of the pullover is shaped to be longer than the front. All joining seams shall be flat locked and all, hems shall be cover stitched. This design provides a garment that is light in weight, low in bulk, has environmental protection, and comfort in movement.